Instagram stories have now become even more popular than posts. That’s crazy! 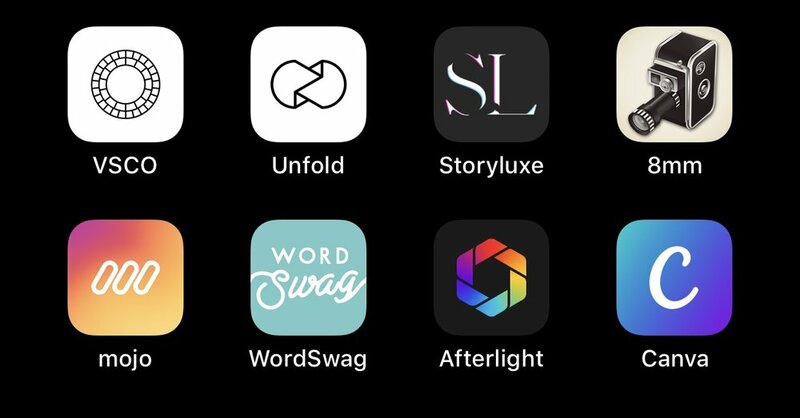 I’ve compiled a list of apps you guys can use to have even more fun with your stories to keep your audience engaged. I use this app not only to quickly edit some photos but also use it to edit video. I decided to pay a yearly subscription for VSCO which gives you all the filters as well as be able to edit videos. This can just give you videos an added pop of colour. Unfold has great templates to use for stories such as film, collages, paper, etc. You can combine pictures and videos into one frame making one story so cool to look at! Recently discovered Storyluxe and like Unfold, Storyluxe has several fun templates to use for your stories where you can combine photo and video. I like to use them because the templates are so different from any other template app. Ever seen the vintage videos that people post on stories? That’s done with 8mm. Such a fun way to video, as if you’re stepping back in time into and old film. I use this app mostly to announce a new post on stories but there are so many options that you can use. They are all animated making each story engaging until the end. In afterlight I really enjoy using the “dust” overlay effects. It gives the pictures a speckle of white. You can use Canva on a desktop or phone. Pick from different templates to use for stories or story highlights. The platform is free to use. Hope you guys found this helpful. I know there are so many apps out there to use but these are the ones I love using the most. Leave me a comment if this article was useful.